CEDAR FALLS, IOWA - Marjorie Zee Applegate, 100, of Cedar Falls, died Thursday, January 29, 2015 at NewAldaya Lifescapes, Cedar Falls. She was born October 24, 1914, in Fulton County, Arkansas, the daughter of Archibald and Savannah Pierce Cowen. She married Ernest Applegate on October 25, 1931 in Mammoth Springs, Arkansas. He died November 5, 1989. She was employed as a salesperson with F.W. Woolworth, Cedar Rapids, for over 14 years, retiring in 1967. She was a member of Glad Tidings Assembly of God Church, Cedar Falls. 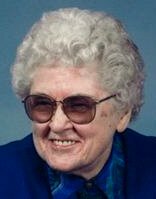 She was survived by two sons, H. Eugene (Beth) of Peoria, AZ, and Lloyd (Joyce) of Cedar Falls; two daughters, Lorene Brown of Wyoming, MI, and Barbara (John) Baril of Cedar Rapids; 15 grandchildren; 24 great-grandchildren; 17 great-great-grandchildren; and a sister, Elsie Miller of Kansas City, MO. She was preceded in death by two brothers, Erwin and James Cowen; by two sisters, Annalee Blackburn and Irene Nichols; a son-in-law, Leland Brown; and a great-grandson. Services: 11 a.m. Friday at Richardson Funeral Service with burial in Greenwood Cemetery, both in Cedar Falls. Visitation for one hour prior to the service. Memorials may be directed to Glad Tidings Assembly of God Church, Cedar Falls.